The Brexit vote, and Donald Trump’s election, confirm that we are in a New Normal world. In the interview below with Will Beacham, Deputy editor of ICIS Chemical Business, I highlight some ideas about how industry needs to adapt. BARCELONA (ICIS)–The global chemical sector needs to stimulate demand for innovative products and services in mature economies so that the benefits of globalisation are felt by people who have been left behind, a leading consultant says. Globalisation is a very efficient method of production, but it shifts manufacturing to low-cost areas, leaving workers in mature economies at risk of under-employment. The chemical sector should adopt more service and solution-oriented business models which will boost demand and employment in high-cost regions, says International eChem chairman. This innovative approach is particularly important for a country like the US where the election of Donald Trump has highlighted anger among voters about falling incomes and hostility to the effects of globalisation. On 21 November, Trump confirmed that he plans to exit the proposed Trans-Pacific Partnership as soon as he is inaugurated. This indicates he does intend to follow through with a protectionist agenda which could result in higher tariffs against US-made chemicals and polymers if a trade war develops. Hodges says the US industry can harness unmet domestic polymer demand to help swallow up the wave of new shale-based capacity due onstream over the next 2-3 years. 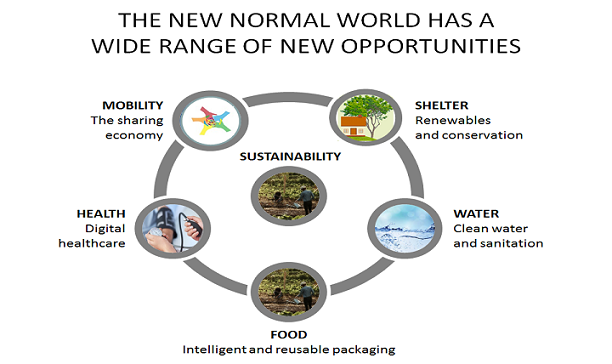 He also suggests developing materials for intelligent packaging to tell people when food is really out of date because 35% of food is currently thrown away. Looking globally, a new political and trading power block will develop as a result of China’s “One Belt One Road” policy which includes countries representing 40% of global GDP, says Hodges. This strategy aims to boost cooperation and trade between China and around 60 countries including Russia, much of eastern Europe, Asia including India and Indonesia, and parts of North Africa and the Middle East. Hodges also believes the chemical industry should adopt the use of smaller, leaner and more efficient manufacturing systems. Imagine your government decided to shutdown most of the industry in two major cities for 2 weeks or more? Say Detroit and Chicago in the US, or Milan and Turin in Italy, or Leeds and Manchester in the UK. Now you will have some idea of the scale of the shutdowns being mandated in China for Shanghai and Ningbo ahead of the G20 Summit in Hangzhou on September 4-5. The reason is the need to improve air quality during the summit, as I noted last month. Hangzhou itself is China’s 4th largest city, with a population of 21m. 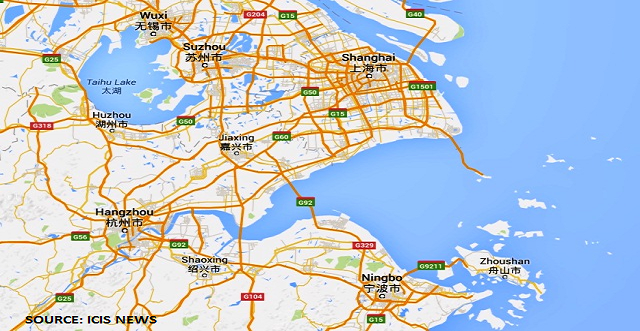 And as the map shows, it is bordered by Shanghai (with 24m people), and Ningbo (8m people). 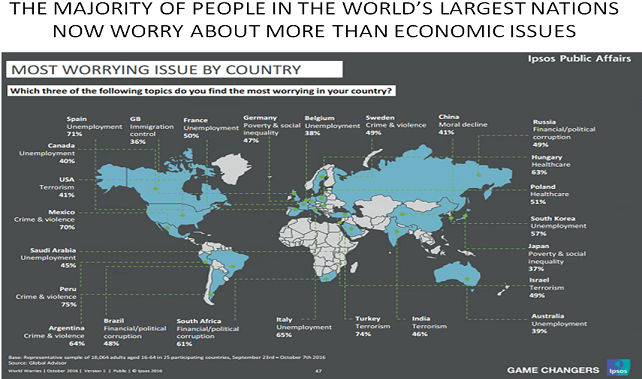 Together, they are one of the biggest industrial conurbations in the world. “Hangzhou is home to major polyester producers, which are expected to implement the prescribed temporary measures to curb pollution until after the summit, market sources said. “For Shanghai, the production cuts and shutdowns will take effect from 24 August to 6 September, according to a document published on the Shanghai Environment Protection Bureau website. Other industries such as steel, coking and cement sectors in Shanghai are also being required to restrict production for a prescribed period, based on the document. These closures/cutbacks will obviously have a very disruptive impact on a whole range of supply chains. Some companies will lose their raw material supplies – others will lose their customers for finished product. So there will be no easy answers for managements – and even if their immediate suppliers or customers are still operating, there may well be closures or disruption in another part of the value chain. Companies outside China, whether suppliers or customers, will clearly also be impacted, given the importance of this region in global markets. My suggestion would be that you need to check as soon as possible with your business partners to gain their insights into the likely outcome, now that details of the plans are becoming clear. Then you will have time to work out alternative options. One other important conclusion is clear. No government would lightly create this level of disruption, particularly at a time when the domestic economy is already under pressure. The fact that President Xi Jinping is taking these major steps, is a sign of the severity of China’s pollution problems. The country simply cannot go back to the Old Normal way of doing things – the New Normal policies are here to stay. US home ownership is back at levels seen briefly in the mid-1980s, and before that in the mid-1960s. One key issue today is that while the US population is still growing, the younger population has quite a different profile from the Boomer generation, as the Pew Institute have reported. In addition, there is a growing trend for retiring Boomers to reverse the “flight to the suburbs” that they undertook in the 1960s/1970s, and instead return to apartment living in the cities. Even worse from the demand viewpoint is that the SuperCycle trend towards single family homes has sharply reversed. Starts for apartment living have doubled as a percentage of the total back to around a third, equal to levels seen 40 years ago. This trend towards apartment living further reduces potential chemical and polymer demand. Although no detailed analysis yet exists on this factor, due to its relatively recent appearance, estimates suggest each apartment only uses around 50% of the materials required for a single-family home. “The goal of this strategy, to boost home ownership to 67.5% by the year 2000, would take us to an all-time high, helping as many as 8 million American families across that threshold”. This target was maintained by President George W Bush. And in the subprime bubble, home ownership rose beyond Clinton’s target to reach 69.2% in 2005. But it has since fallen back to pre-1995 levels and the current figure of under 64% equals 1964 levels. A major part of the problem is simple affordability. Younger people are the key demographic for home buying, as they constitute the critical first-time buyer group. But Pew data shows that 92% of recent population growth has been in minority communities, whose earnings are generally less than those of the white population. This means that the average ratio of house prices to earnings of 9.0x disguises a wide variation. Whites are close to the average at 8.7x, while Asians are below it at 7.4x. But for the younger Black and Hispanic populations, which are critical for driving first-time home buyer sales, the ratio rises to 11.6x for Blacks and 12.0x for Hispanics, based on US Census Bureau data for new home prices. Unsurprisingly, latest National Association of Realtors data show the share of first-time home buyers is now at its lowest level since 1987 at just 32%, having fallen for the past 3 years. These are the issues that we focus on in the Demand – the New Direction for Profit study. And since we published this just 2 months ago, it has become clear that the risks of assuming stimulus programmes will deliver their promised results are rising all the time.